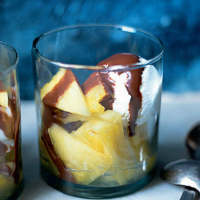 Bursting with Mexican flavour, pineapple and ginger make a refreshing dessert. Find our adult version at the bottom of the page. Begin by preparing the pineapple. Using a large, serrated knife, slice off the top and bottom. Stand the pineapple upright and slice off the skin. Quarter the pineapple lengthways, then slice out the central core. Cut out any 'eyes', then cut each quarter into thick slices and place in a heatproof bowl. Pour the warm syrup over the pineapple and leave to cool. Cover and chill until ready to serve, topped with the ice cream and a generous helping of chocolate sauce, if using. To make this dish for adults, add 2-3 tbsp tequila to taste at the end of step 2, and use Waitrose Seriously Creamy Stem Ginger Ice Cream instead of vanilla.